At approximately 12:10 on Monday 24th April, a detachment of Volunteers and members of the Citizen Army lead by Patrick Pearse and James Connolly entered the General Post Office and seized control of the building. Immediately on occupation, Pearse stepped outside, and on behalf of the Provisional Government of the Irish Republic read the Proclamation of Independence. Having secured the G.P.O. and most of Lower Sackville St was a serious problem for the British army who quickly became averse to deploying large numbers of ground troops in street fighting. By Wednesday the military strategy of heavy shelling was adopted, with field guns positioned on D’Olier St and the ‘Helga’ gunboat moored less than a kilometre away, producing a constant barrage of destructive firepower on rebel positions. 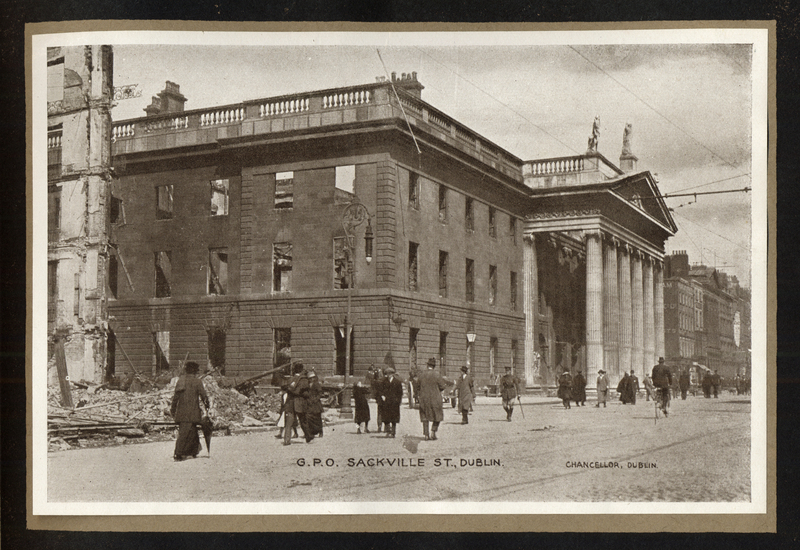 By Thursday evening the whole of Sackville St was ablaze, and by Friday, fires were raging inside the GPO. With Pearse ordering the abandonment of their headquarters, the remaining fighters pulled back to different locations in the city centre, whilst the leaders, including a badly injured Connolly, retreated and regrouped to a nearby grocery shop at 16 Moore St.